Stealing the World with Hanging Chad. Those who vote decide nothing. Those who count the votes decide everything. RECOUNT is another nail in the “democracy” coffin. Even for those who detest politics, this movie unfolds like a thriller rather than a dusty legal doc. Surely no one in Amerika believes the lie of “One Man One Vote”? Surely no one believes their vote “counts”? It’s not that everyone’s vote doesn’t count. The lowest-rung incompetents empowered with the fate of the country and, by association, the world, do count the majority of votes, sure. But a bigger percentage than would make anyone feel comfortable simply gets thrown out, lost, disqualified, unregistered, purged, re-directed, or – cue duplicity on toast – RECOUNTED. Back in 2000, Republican liar and nitwit, George W. Bush, stole the American presidency from Democrat man-bear-pig Al Gore on the strength of confusion generated by a disturbingly imperfect, manual voting system exacerbated by disturbingly imperfect manual morons. Written by Danny Strong and directed by Jay Roach, RECOUNT tells the backstage story of the infamous Florida Recount, from the hanging chad to the purged felons. Well-researched, well-written, well-directed; myriad events on their own separate tracks or classified at the time, now juxtaposed into a cogent story of deceit, apathy, misfeasance and malfeasance that rivals the most twisted pulp fiction Hollywood can rat-spit. Kevin Spacey is Ron Klain, Al Gore’s ex-Chief of Staff, who returns to the Democrat fold when, during the last stages of the 2000 presidential election, a computer glitch necessitates a recount of votes in Florida. The winner in Florida would win the presidency. Denis Leary is excellent as a Gore strategist and Klain’s right-hand; his pivotal scene is explaining the significance of “chad.” The chad was the perforated stub that voters had to punch out on their ballot cards. Chad (plural: chad) were notorious for “hanging” from their perforations if they were not fully punched out, and counting machines sometimes re-sealed these “hanging chad” as the cards were fed through. This meant the person’s vote did not register. 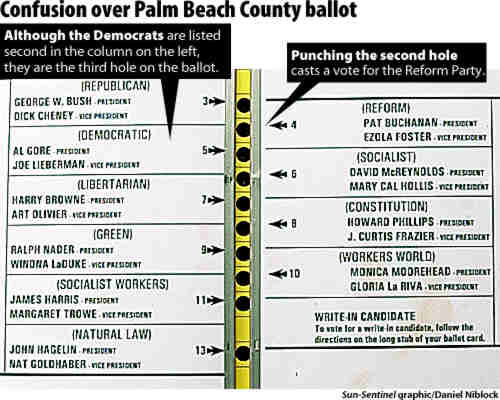 To exacerbate problems, the ballot cards were “butterfly ballot” design (see below), that confused people who rarely use their brains – that would be 90% of voters – many votes accidentally cast for Pat Buchanan’s Reform Party (which Buchanan freely admits today). The Democrats sue for a recount – and the Republicans roll out their big gun lawyer: James Baker (an imperious Tom Wilkinson), Reagan’s Chief of Staff and George H.W. Bush’s Secretary of State. Ed Begley Jr. is dyslexic Democrat lawyer, David Boies, while Bob Balaban plays snide Republican lobbyist and Baker’s right-hand, Ben Ginsberg. In Florida law, if the vote difference between candidates is less than 30,000, every county has to run their ballots through the machines a second time – an automatic recount. Bush versus Gore was so close, an auto recount was assured… But 18 of the 67 counties didn’t run their ballots a second time, leaving 1.5 million votes uncounted. What happens NOW in a “democracy”? Confusion. The Purge List is unveiled: people disallowed to vote – felons and names who resembled felons. Since Nixon, the Republicans have always come off as a pigpen of deceitful, underhanded thugs. By the 2000 election, their thuggery and unethical practices were out in the open: Republicans would rather block or confuse the election process (and thereby lose even Republican votes), than have Democrat votes counted, because they play the percentages. They know that if the process were allowed to proceed fairly, they would ALWAYS LOSE, because on sheer numbers, more Democrats than Republicans vote, so in blocking, say, 30% of votes from getting counted, they block a higher percentage of Democrat votes from being counted than Republican votes. Even as I write this, the Republicans are conspiring to steal the election from Barack Obama in 2008, evidence of their lies and talking-snake politics and smears already apparent. At one point, when hand recounts are called for and the Republicans (led by George W. Bush) protest the method, Klain uncovers a statute in Texas that cites hand recounts as the “preferred method” – signed into law by Texas’s then-governor – George W. Bush! It is amazing to realize what a JUDAS WHORE Joe Lieberman was even way back in 2000, while he was still posing as a Democrat – on the Vice President’s ticket with Gore, no less! Actual footage shows Leiberman on MEET THE PRESS, insisting undated military votes should be counted (swinging the votes in Bush’s favor) – after he was expressly advised by Klain that they shouldn’t be counted because with no post-mark, it could not be determined whether they were submitted after the election date. 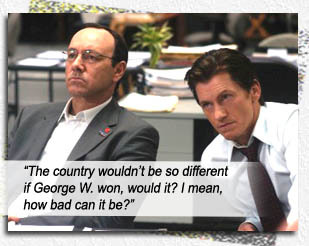 If the country was as non-partisan as this movie, there might have been a different outcome – it’s painfully regretful to imagine that one thread of time unravels in that non-W direction, like a sci-fi scenario – but the Republicans overlorded Florida: not only was Harris stultifying recounting, Florida’s governor was George W.’s mildly-Special-Olympics brother, Jeb. Katherine Harris declares Bush winner before anything had been resolved and (true to Republican form) she lies outright: “Democracy has triumphed once again” (though democratic processes were not used) “the true winner of the election is the rule of law” (though no laws were adhered to); ending with the lies of a Bush win and the lies of “God bless America” (the lie of God, or even if there was God, the arrogance to think It would “bless” a deceitful whore like Amerika). The Dems escalated the case to the Supreme Court in the now-infamous Bush vs. Gore. History tells us Bush won, the Supremes decreeing there was just not enough time to recount everything (geez! You’d think each citizen wanted their vote to matter or something!). The actual numbers tell a different story – but we’ll never discover it, all the ballot cards with their accusatory chad relegated to a subterranean vault guarded by a Balrog. 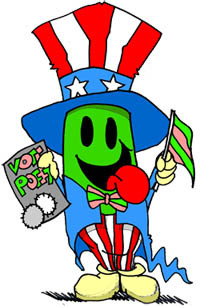 Here’s the stinger for you democracy-lovers and Amerikans-in-denial: Florida legislature planned to award the 25 Florida electoral votes to Bush ANYWAY. No matter the outcome of the recount. Ergo: your vote, counted or not, doesn’t count. Movie outro shows the real players in this thriller/drama/execution of sanity, while Tom Petty’s Won’t Back Down plays us out. Only one of them meant it. Starring: Kevin Spacey, Denis Leary, Tom Wilkinson, Laura Dern, Bob Balaban, Ed Begley Jr., John Hurt.